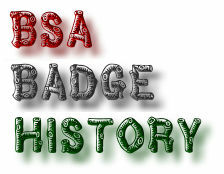 It is my intention to bring you a little history about scout badges. This is research by me and others who have spent a great deal of time learning about and categorizing these early scout badges. It is my hope that what you learn from these pages, you will pass on to others for the greater enjoyment of scouting. I welcome any questions, so please feel free to e-mail me. If you are looking for great old resources for scouting, a good place to browse is "The Dump". It is filled with PDF files for your use. Link to webmaster's scouting background. This is not an official site of the Boy Scouts of America. The rank badges are scanned images of mine and other's collections and the scanned images are copyright. You are welcome to print these pages for your reference. However, if you would like to use the images in any other manner, you must receive permission from Craig Murray.